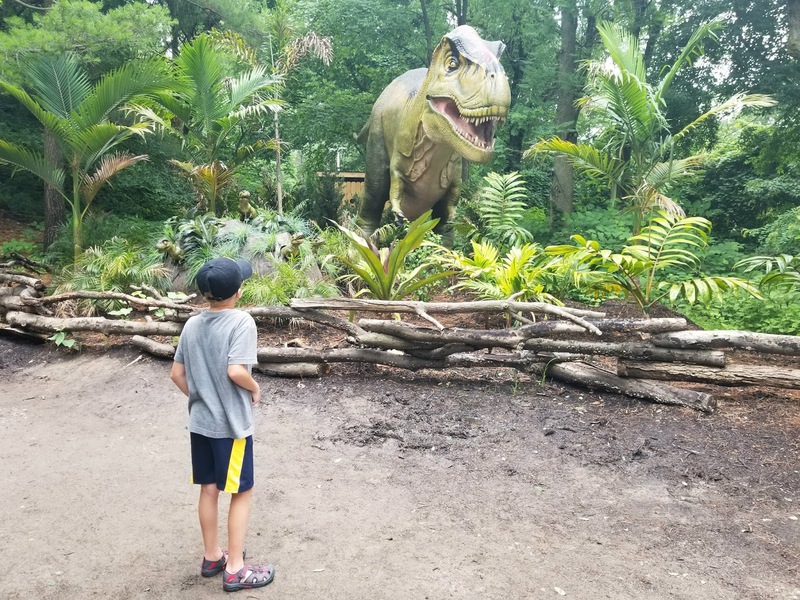 Dinosaurs are always a surefire way to capture my son's attention and get him excited. 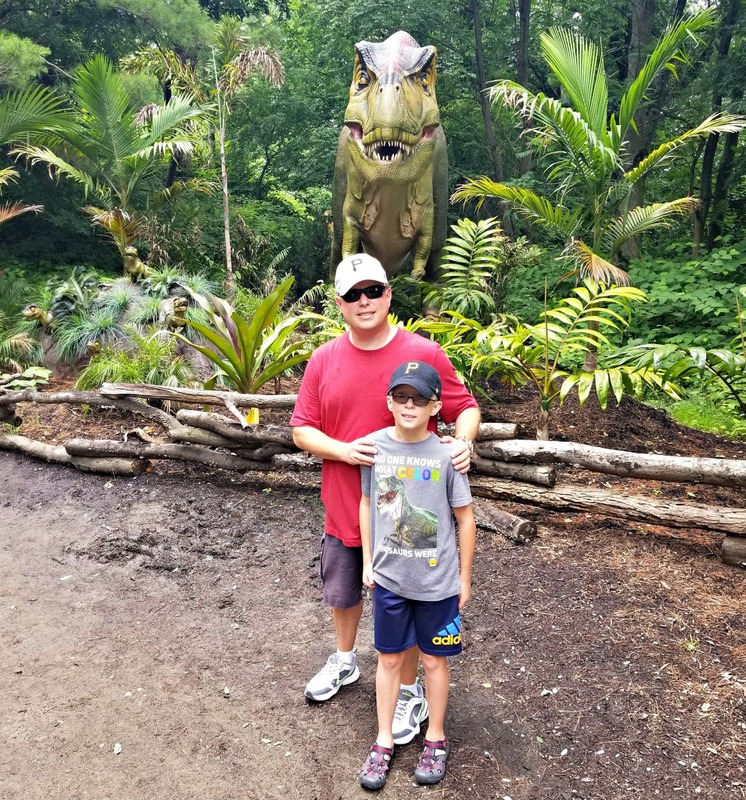 So when we decided to go on a dinosaur themed father - son road trip, to say he was enthusiastic about our adventure was an understatement. So we headed off on a weekend getaway to Pittsburgh for our dinosaur expedition. First stop was the Carnegie Science Center in downtown Pittsburgh, Pennsylvania. 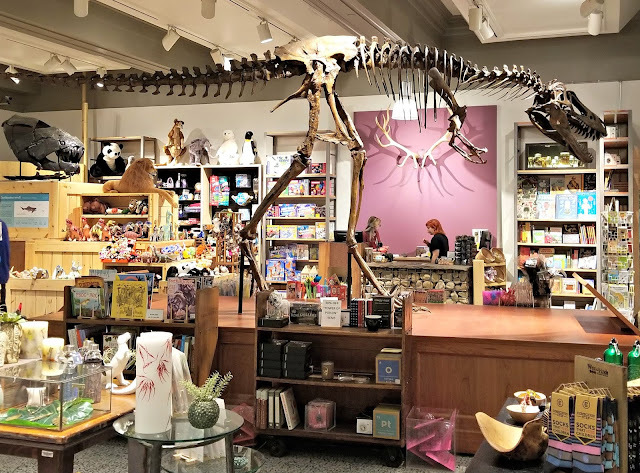 This four floor museum is full of interactive exhibits meant to ignite people's imagination and interest regarding science. We went though to see a Tyrannosaurus rex made out of LEGO bricks. On temporary exhibit at the science center from June 16, 2018 through January 7, 2019 is "The Art of the Brick." Described as the world's largest exhibition of LEGO art, the sculptures by artist Nathan Sawaya on display are made exclusively from one of the most recognizable toys in the world: the LEGO brick. 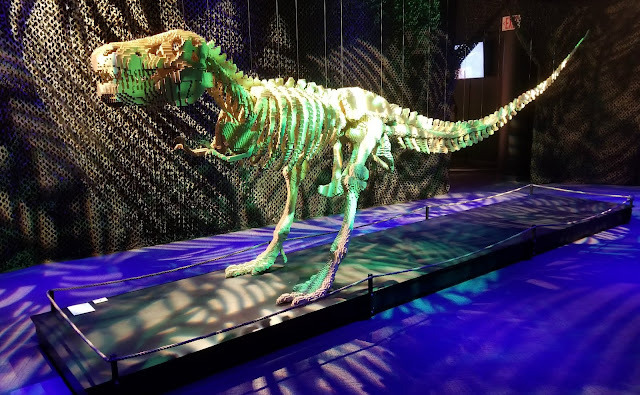 In addition to an amazing T-Rex dinosaur, "The Art of the Brick" also includes re-imagined versions of some of the world’s most famous art masterpieces, including Van Gogh’s Starry Night and Da Vinci’s Mona Lisa, as well as other original artwork crafted by Sawaya. Anyone who has ever unleashed their imagination playing with LEGO toys will find themselves spellbound looking around this art collection. Later during our weekend in Pittsburgh we returned to see JURASSIC WORLD 2: FALLEN KINGDOM on a giant movie screen. The Rangos Giant Cinema is 70 feet wide by 38 feet tall so the dinosaurs on the screen definitely looked big. Plus they popped out at us in crisp 3D thanks to the theater's 4K Christie Laser Projectors. And with more than 45 speakers providing surround sound it really is an immersive movie watching experience. 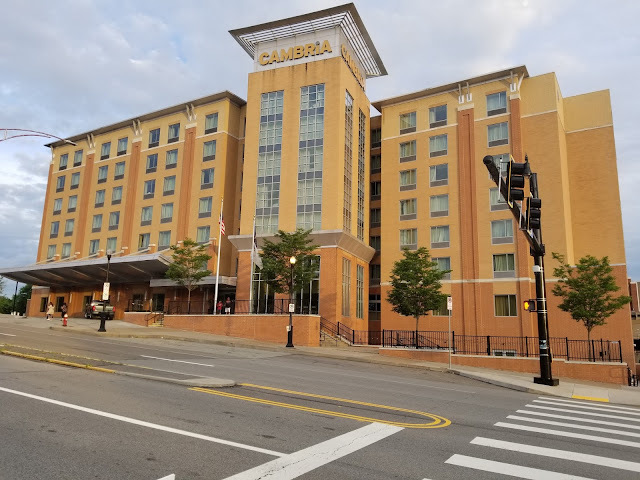 Though our hotel, CAMBRiA Hotel Pittsburgh, was located across town from the science center it was really easy and convenient to get between the two thanks to the city's nice mass transit system. A subway station was just a 10 minute walk from our hotel and the train ride dropped us off literally at the front door of Carnegie Science Center. Plus riding the subway is always FREE with no fares to pay when traveling between its downtown stations! 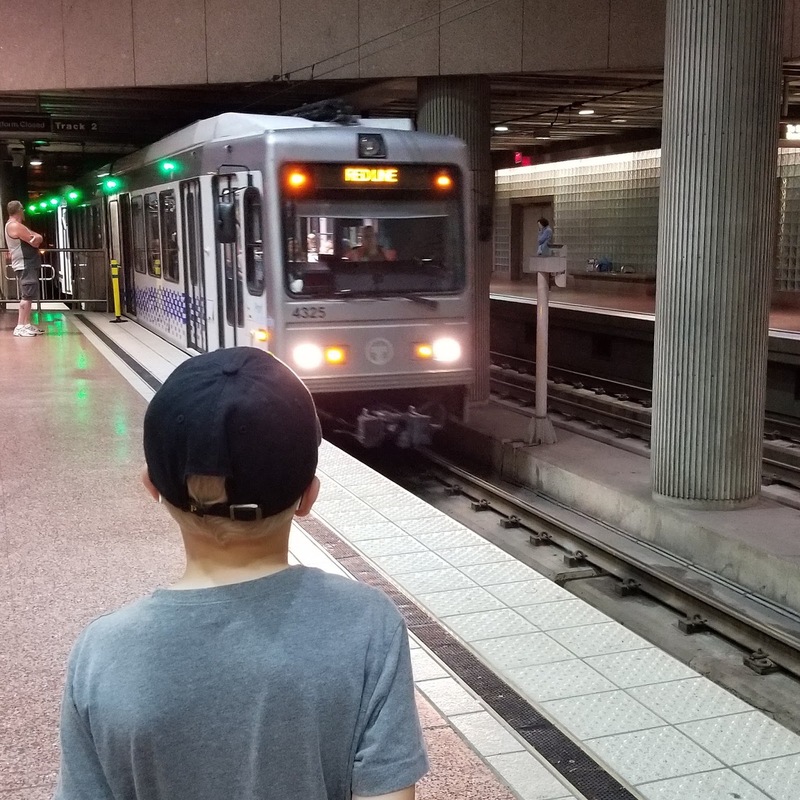 The cars and stations felt safe, were very clean, it was easy to get to where we needed to be, and you can't beat riding for free. 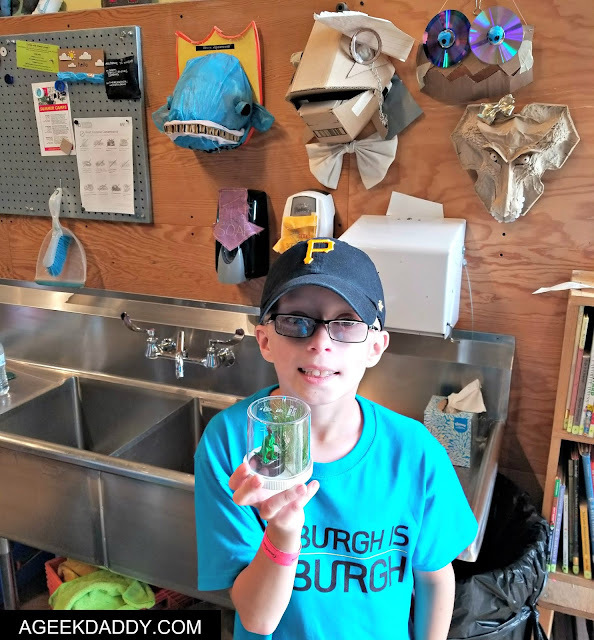 We dropped by the Children's Museum of Pittsburgh as we continued our search for dinosaurs. This museum aspires to inspire joy, creativity and curiosity through educational and entertaining activities and exhibits. My son had a fun time making a miniature dinosaur habitat in the museum's MAKESHOP arts and crafts area. He took a lot of pride in his completed project! If you are looking to see dinosaur fossils, the Carnegie Museum of Natural History is one of the top places to go within the United States. It has the world's largest collection of dinosaur fossils from the Jurassic period of the Mesozoic Era of our planet's history. 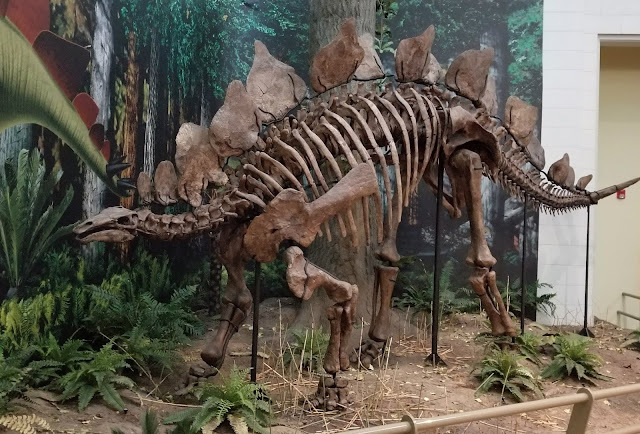 The museum also has the third largest display of mounted dinosaur skeletons within the country behind Washington DC's Smithsonian Museum of Natural History and New York City's American Museum of Natural History. Several of the dinosaurs you will see on display at this museum—including the iconic Apatosaurus louisae, Diplodocus carnegii, and Tyrannosaurus rex —are holotypes, which means they are original skeletons that were the first to be discovered and put together to define a species. This really is an impressive and prestigious display that anyone who has an enthusiasm for learning about dinosaurs should absolutely make an effort to visit sometime. So we found our dinosaurs! My son was so excited as he wandered through the exhibit galleries taking everything in. I could tell he wanted to reach out and touch them but of course that is off limits. After all these fossils are millions of years old. A docent though unlocked a cabinet for us and pulled out an authentic fossil of a dinosaur bone that we could hold and touch. Wow! What a wonderful experience! 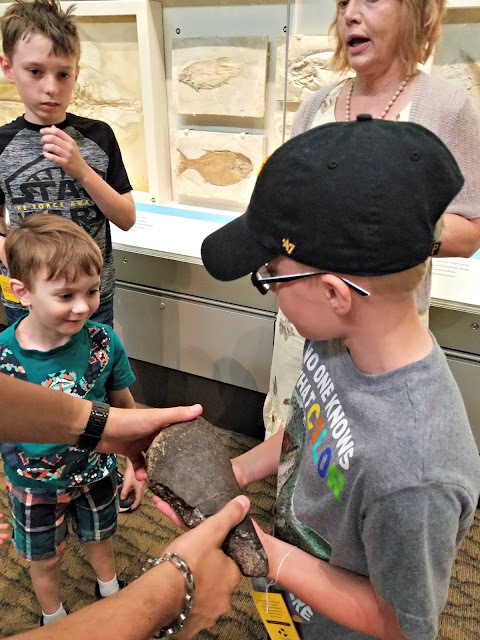 In addition to its dinosaur displays, the Carnegie Museum of Natural History continues to study fossils for insight into the creatures and habitats from prehistoric times. A portion of their labs are windowed so visitors can watch them at work. 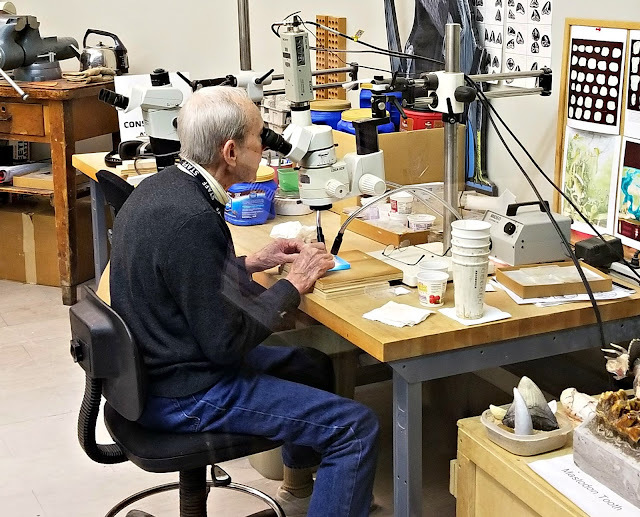 We spent some time watching a paleontologist examining a fossil under a microscope. It was neat that what he was seeing under the microscope was also projected onto a television screen so we could see as well. Before leaving the museum, we popped into the gift shop to look at their souvenirs. Standing guard over the store was a T-Rex. One last dinosaur to see on the way out. Our dinosaur expedition wrapped up with a visit to the Pittsburgh Zoo to see a special summer exhibition. We took a dinosaur trek walking along a path that had a number of life-like animatronic versions of these prehistoric creatures along it. These robotic dinosaurs move and bellow to provide the impression you've walked back in time to the Jurassic period. My son ran up and down the trail excited to see what we would come up next along the path. Hey! We just saw this guy's skeleton at the Carnegie Museum of Natural History! Actually they had quite a few fossil skeletons of many of these same dinosaurs on display. It was really interesting to view those fossils then turn around and see these reproductions of what they would have looked like while alive. 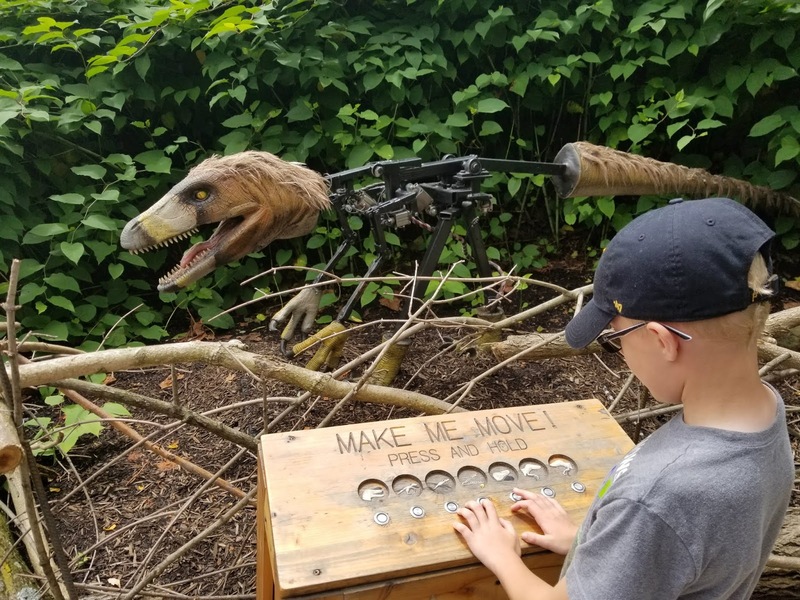 Adding some STEM (Science, Technology, Engineering & Math) to Dinosaurs at the Zoo, there is a Deinonychus whose interior mechanics have been exposed with a control box so that people can direct the robot's motions. 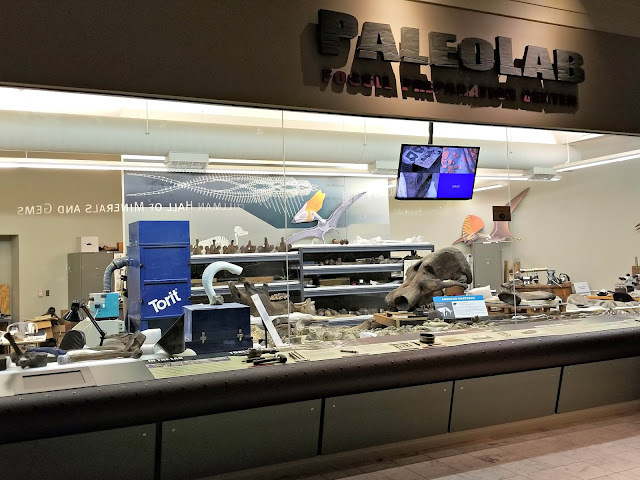 We may have spent more time enjoying this interactive display than we did walking through the rest of the exhibit … and we spent a lot of time walking with the dinosaurs! You have to admit combining robots with dinosaurs is an AWESOME duet. 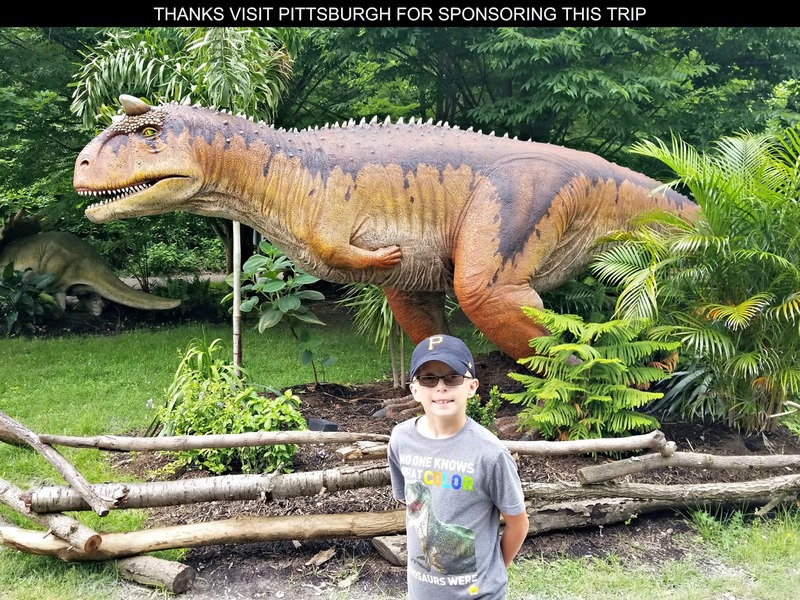 When thinking of dinosaurs, Pittsburgh may not be the first place that comes to mind but I have to say it was the perfect destination for our themed road trip. My son and I had an incredible time! With so many family-friendly places to go and things to do no wonder they are calling the place Kidsburgh. 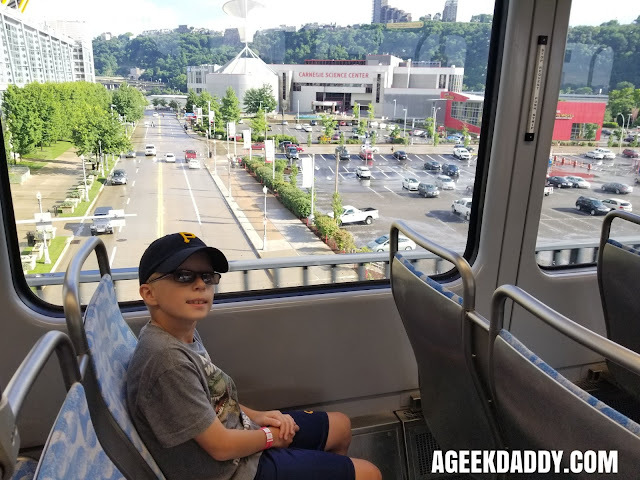 This city has earned A Geek Daddy nod of approval as being a great place to vacation with kids. Whether just for a weekend getaway or spending an entire week there, I guarantee you will have an enjoyable stay with lots of fun stuff to do. For more information about planning your own trip to Pittsburgh, head over to visitpittsburgh.com, the website for the official tourism promotion agency of Alleghany County. Thanks Visit Pittsburgh for sponsoring our visit. 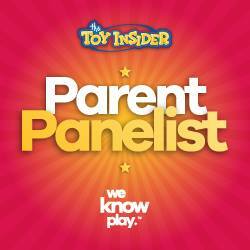 While this was a hosted trip please note that the views and opinions expressed are honest and my own. What a fantastic trip. My boys would have enjoyed this too. We used to plan themed adventures too. It is such a great opportunity for enrichment and to have some laughs together. I guarantee your son will always remember these times together. Booyah! Now that sounds like an awesome road trip. I have never outgrown dinosaurs. A dino-themed trip sounds like so much fun! I bet watching the new Jurassic World on that huge screen was awesome. I saw it in the regular theater and it was thrilling! I love that you take your kids to museums and to learn about paleontology! It's great to expand their minds into the fields of science and get them excited about learning. When I was a kid, museums were my absolute favorite experience, especially when I could learn about dinos. Oh wow how much fun does this look! I mean who doesn't want to go and take a trip with the dinos! I would have loved this as a kid. Oh my boys would love this too! The displays would captivate him the most and especially any reference to Jurassic World. What a fun place to explore! 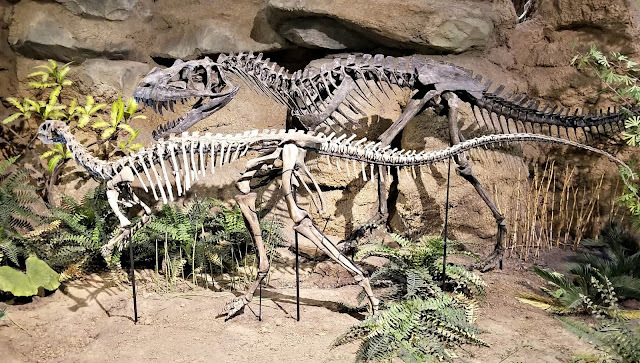 My kids would love the Dinosaurs - we've never been to an exhibit like this. this is such a great quality time and its just not for the a fun and of course to educate them for the great life before..
How fun is this!?! I would have loved to go there when I was younger. I was all about dinosours for several years. We have recently gone to the Field Museum of Natural History. I don't think they had this much cool dinosaur stuff. Such a great place to explore and learn. 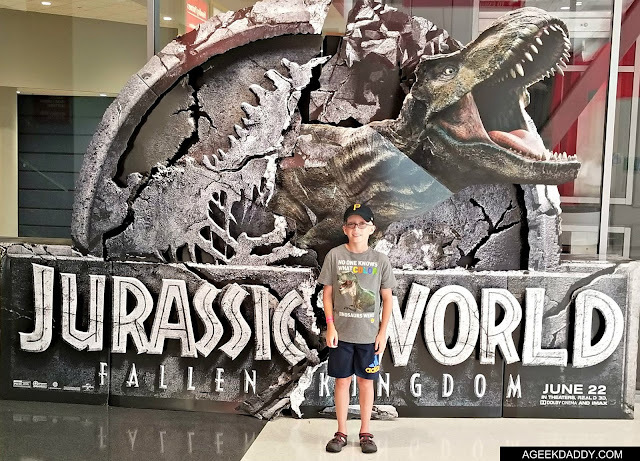 I would love to visit with my kids especially my son who is passionate about dinosaur. I have never been to Pittsburgh! My kids love dinosaurs! I am sure they would want to visit this museum. It looks like he really enjoyed his time! Pittsburgh is such a wonderful city. I would love to go see Pittsburgh sometime. My kid loves dinosaurs. You guys have been hitting up all the dinosaur exhibits lately! Looks like a lot of fun. I've heard Pittsburgh is a cool city, and I've heard good things about the Cambria brand too. Yay for dinosaurs! 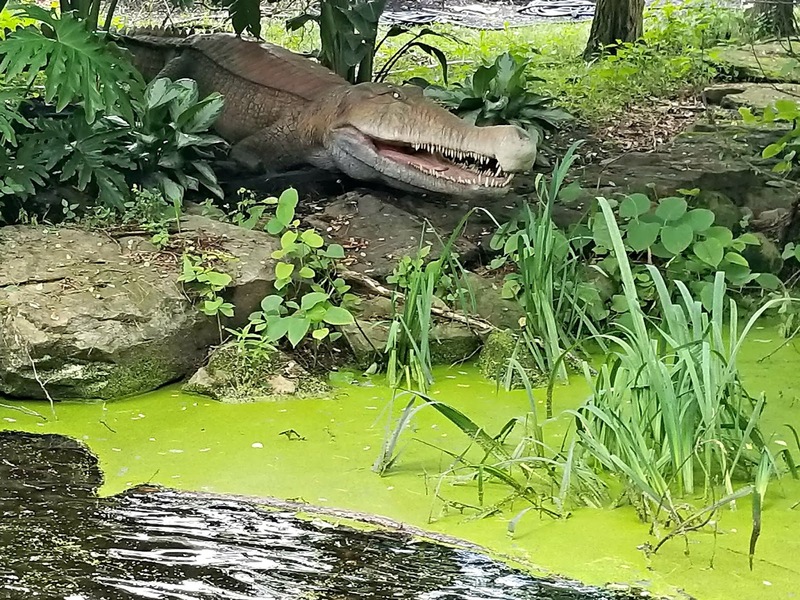 My son would even love the subway ride ;) I wonder if the dinosaurs at the zoo are similar to the Detroit Zoo's Dinosauria exhibit for the summer? it is a very similar set up between the zoo … appears the same company probably is behind producing both exhibits. I think I would have more fun than the kids would going on a dinosaur road trip. I've never been to Pittsburgh, Penn, but now this is on my to-do list when I head back up north with time to spare. We have a Dinosaur World here in Florida. It looks a lot similar to this. My daughter would love to visit here. What a fun place overall, but that part where you can move the dinosaur is really cool. My kids would love that.